Your stock flywheel weights over 27lbs… Ouch, that’s HEAVY! This factory dual mass flywheel has a huge impact on the peppy little 4-cyl engine in your BMW: They are typically characterized as ‘’sluggish’’ and not having the M Car personality enthusiast crave when they drive. Our super light JB Racing Flywheel weighs in at only 9 Lbs, and offers lightning fast up shifts and down shifts, amazing improvement in throttle response, durability, and more power to the ground by reduced rotating mass. A real upgrade without messing with the engine or gearing of the car. Many customers have called a light weight flywheel "The best bang-for-the-buck money I have spent on my car". Supplied ready to bolt in, with hardware, and accepts original clutch sets or upgraded clutch kits. We recommend pairing a lightweight clutch with a ‘spring hub’ style Clutchmasters clutch. This will offer better power holding during sporty driving, and the sprung hub helps reduce clutch chatter and noise when used with a single mass flywheel like the JB Racing pieces. Non-a/c equipped cars have a different flywheel that A/C equipped cars. These were sold outside of the US market. 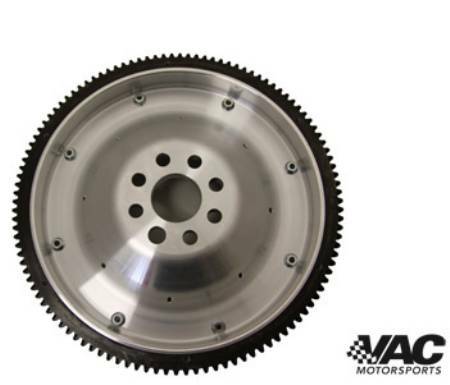 If you have a Non-A/C version, you must purchase the A/C-Equipped clutch for use with the JBR replacement flywheel. From Peter Craig of San Jose, California on 6/13/2013 . 1990 - 92 E30 318i w/ AC, M42 1.8L - 4 cyl. 1989 - 91 E30 318is w/ AC, M40, M42 1.8L - 4 cyl. 1989 - 98 E36 318i - M42, M44 - 4 cyl. 1991 - 99 E36 318is (w/ AC) - M42, M44 1.9L - 4 cyl. 1994 - 00 E36 318ti (w/ AC) - M42, M44 1.9L - 4 cyl. 1994 - 98 Z3 1.8 w/ M43 1.8L - 4 cyl. 1995 - 99 Z3 1.9 w/ M44 1.9L - 4 cyl. cyl.